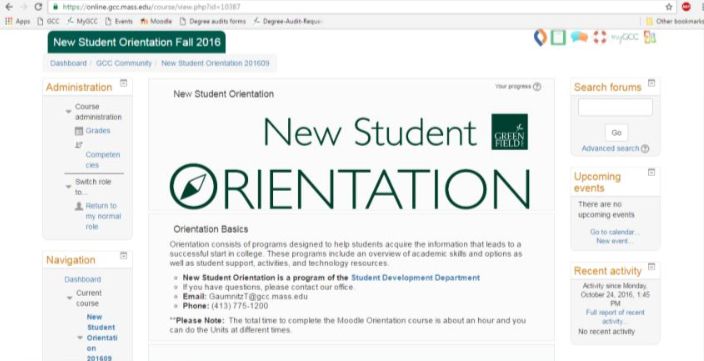 After you’ve watched President Pura’s welcome, use the back button on your internet browser to get back to the Moodle Orientation course. Use the embedded player to progressively view the orientation content and take unit quizzes in Unit 1 and Unit 2. Important: The Moodle course may not automatically “check” the completion box after you view the video. If you experience this issue, please click the “refresh” button in your browser. When the page refreshes the box should be checked and the next unit should be available. Once you complete viewing the presentations and taking the unit quizzes, click on FINAL STEP: Complete Orientation! in Unit 3. Complete questions and make sure to Save and submit. Note: Holds take up to 15 minutes to be lifted from the time you complete the Moodle course.